Grete Minde is a bitter-sweet love story, about eighty-pages long, which is concerned with our titular heroine. Poor Grete is having a tough time of things after the death of her mother as her pious sister-in-law doesn’t approve of her manners or her burgeoning relationship with the neighbours’ son, Valtin. Things get worse when Grete’s father dies, and after a particularly violent argument, Grete and Valtin run away together. Years later, the young woman returns to her hometown of Tangermünder, and that’s when things really hot up. Aquis Submersus, at sixty pages one of Storm’s longer efforts, is (as Storm was wont to produce) a frame narrative, beginning in the nineteenth century, before dragging us, via a second text, back to the middle of the seventeenth century. A young man is fascinated by a portrait of a dead child he sees in a church, and the letters C.P.A.S. (Culpa Patris Aquis Submersus) at the bottom seem to hint at a drowning caused by the father’s negligence. When our friend stumbles across some old documents however, he discovers that the story is more complex than that. Although I chose the two stories virtually at random, there is an incredible amount linking the two stories. Both were based on real-life events (both from the seventeenth century! ), and the two stories have remarkably similar themes. Family members get in the way of young lovers, either for reasons of religion or social status. In both works, the role of children is a dominant one. Both novellas also have a natural break in proceedings, with the culmination of the story coming a matter of years later. 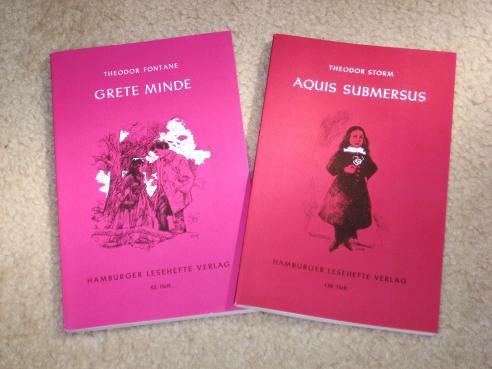 Both novellas are well worth reading, but Aquis Submersus is much more typical of Storm’s work than Grete Minde is of Fontane’s. However, by the time I got to the end of the two books, there was something else bothering me. The Hamburger Lesehefte are great (cheap!) copies of German classics, but I’ve gone off them a little and, for many reasons, am no longer as much of a fan as I was. Tony, you missed the perfect headline for this one “Two Teds are better than one”. I agree with your idea on the cheap editions becoming pointless when you can find E-copies for nothing, especially as most readers let you play with font size. Have had a couple of those myself & have enjoyed them, but sometimes free is all you are willing to pay, unless there's some reason not to, for example annotated notes etc, giving a greater level of interest/understanding. Here I try again to leave a comment. No IT wizzard to have me write unreadable letters to let me through the commenting box. Thanks for the change, Tony. I tried at least 10 times this morning, obstinate as I am. I enjoyed how you linked the two books and cross-reviewed them. I'm not going to rush to them though. I agree with you. I think e-books will kill cheap paper editions, except for the beach, after all, who wants to have sand and suncream on their kindle? I think there is a place for paper classics, but they need to have extras now that free e-versions are available. Obviously, publishers like Oxford and Penguin will always have their followers, but those like Wordsworth and Hamburger Lesehefte will have to ensure that what they offer is worth the few dollars you could save by looking online instead. Most classics are online, but it's always good to have notes and scholarly introductions. This need to balance cost and extras is what makes publishers like Wordsworth so important.